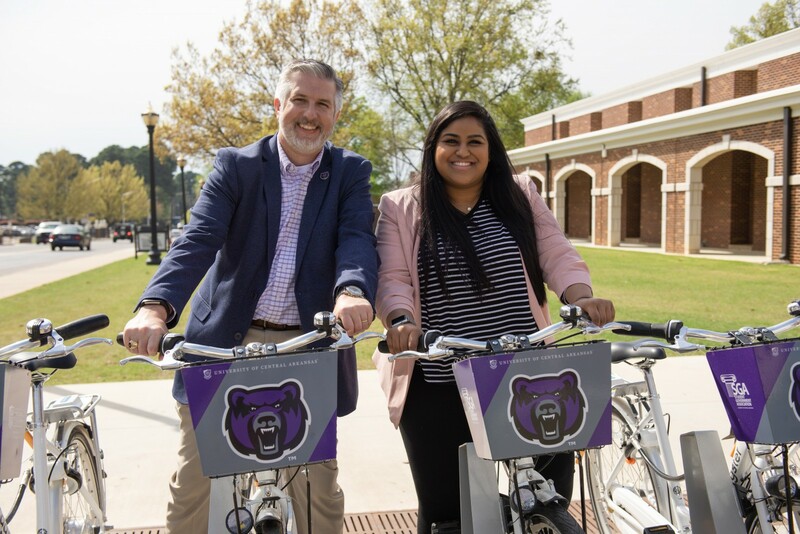 UCA President Houston Davis and SGA President Hershila Lallu prepare to ride Zagster bikes. The University of Central Arkansas Student Government Association hosted a launch party to celebrate the expansion of Zagster to the UCA campus. The Zagster bike share initiative falls under the umbrella of the city of Conway’s Bike Share initiative. The UCA expansion will allow students to seamlessly access Zagster bikes and bike stations on and off campus. Bringing the Zagster bike share program to UCA was spearheaded by the SGA in partnership with the UCA Office of Housing and Residence Life. The Zagster Bike Share Stations at UCA are located at the Student Center, Mashburn Hall, Win Thompson Hall, Bear Village and between the Lewis Science Center and Conway Corp Center for Sciences buildings. To use the program, users must download the Zagster app. They can purchase an annual membership or pay by the hour. The program became fully operational with a soft launch that began on March 27 and ends April 5. During this time, the first 90 minutes of a bike ride are free for first-time signees.